My family loves pancakes! The only problem with them is that they take some time to cook up, even if you use a boxed mix. So if you’re usually short on time in the morning, you’re probably used to always having cereal or commercial frozen pancakes and waffles. But those options aren’t usually enough to really keep you full until lunch, and may contain some mysterious added chemicals. 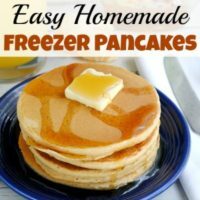 If you want to have delicious homemade pancakes for breakfast even on busy days, then you need to make Easy Homemade Freezer Pancakes! You could flavor these however you like! Adding mix-ins like chopped fruit or chocolate chips won’t affect how these heat back up. 1. Combine the main ingredients, mixing well. If opting to use mix-ins, you can add them to the batter at this stage, or you can sprinkle them onto each pancake as soon as the batter is on the griddle. 2. Heat a large frying pan or griddle with butter or non-stick cooking spray. 3. Use a small 1/4 cup size measuring cup to pour the batter out onto your pan. You’ll likely have the space to cook several pancakes at once. Cook until the tops bubble and then flip. Cook until golden brown. 4. Once the pancakes are cooked, remove from heat and allow to cool completely. 5. Lay the gallon storage bag flat and lay 4 pancakes inside. Place a square of parchment paper over the 4 pancakes and repeat the stacking process between squares of parchment paper. 6. Repeat until the bag is full. I was able to get all the cooked pancakes inside a single gallon freezer bag. 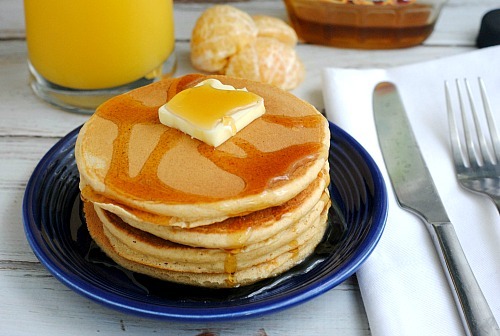 Simply remove the pancakes from the freezer and reheat them in the microwave. I heat them 2-3 at a time for about 1 – 1 1/2 minutes. Then you’re ready to enjoy your homemade freezer pancakes! 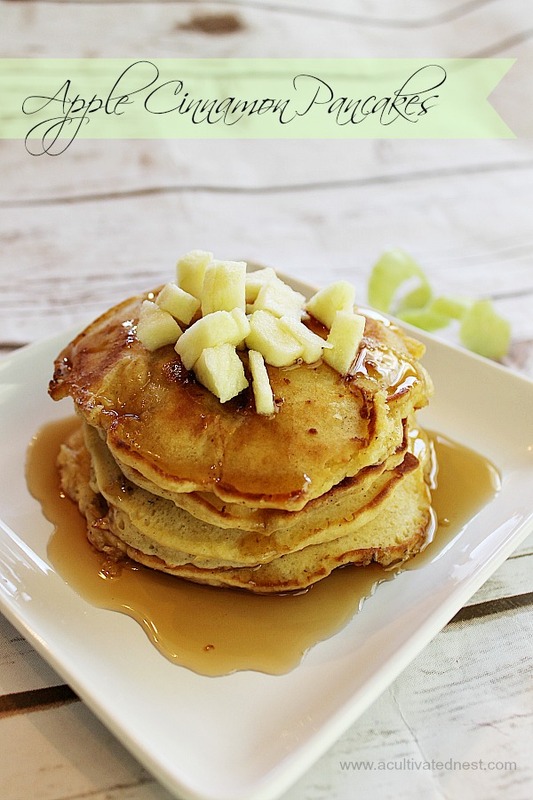 These would be especially tasty topped with homemade cinnamon syrup! Have delicious pancakes every morning, even if you’re in a rush, with this freezer pancakes recipe! Combine the main ingredients, mixing well. If opting to use mix-ins, you can add them to the batter at this stage, or you can sprinkle them onto each pancake as soon as the batter is on the griddle. Heat a large frying pan or griddle with butter or non-stick cooking spray. Using a small 1/4 cup size measuring cup to pour the batter out onto your pan. Cook until the tops bubble and then flip. Cook until golden brown. Once the pancakes are cooked, remove from heat and allow to cool completely. 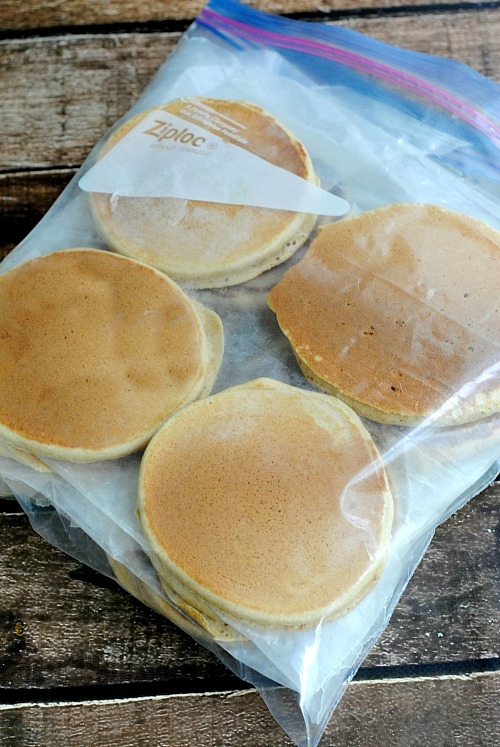 Lay the gallon storage bag flat and lay 4 pancakes inside. Place a square of parchment paper over the 4 pancakes and repeat the stacking process between squares of parchment paper. Repeat until the bag is full. I was able to get all the cooked pancakes inside a single gallon freezer bag. To reheat- Simply remove the pancakes from the freezer and reheat them in the microwave. I heat them 2-3 at a time for about 1 – 1 1/2 minutes. Great tips! We make pancakes and waffles on the weekend and use them during the week — the kids love them. Thanks for sharing at Merry Monday! I love being able to make my own food and freeze it for later use rather than getting that processed stuff at the store. Thanks for linking up with Delicious Dishes Recipe Party!